The unfussy yet undeniably sophisticated style of this Smoky Quartz and Diamond Halo Gemstone Ring in 14K White Gold allows a unique and gently alluring gemstone to take center stage, and take a starring role in which it slowly but surely mesmerizes all who see. This is a ring with understated elegance and a unique sense of sophistication that works with nearly any outfit. Just as it's hard to look at a crackling fire without getting draw in by the ever-changing flame, you'll be hard-pressed to look into a smokey quartz without becoming slowly but surely transfixed by its understated beauty. The 7mm smokey quartz that glimmers from the center of this ring lives up to its name in that its subtle brown hue calls to mind the curls of smoke that rise from a fall bonfire. 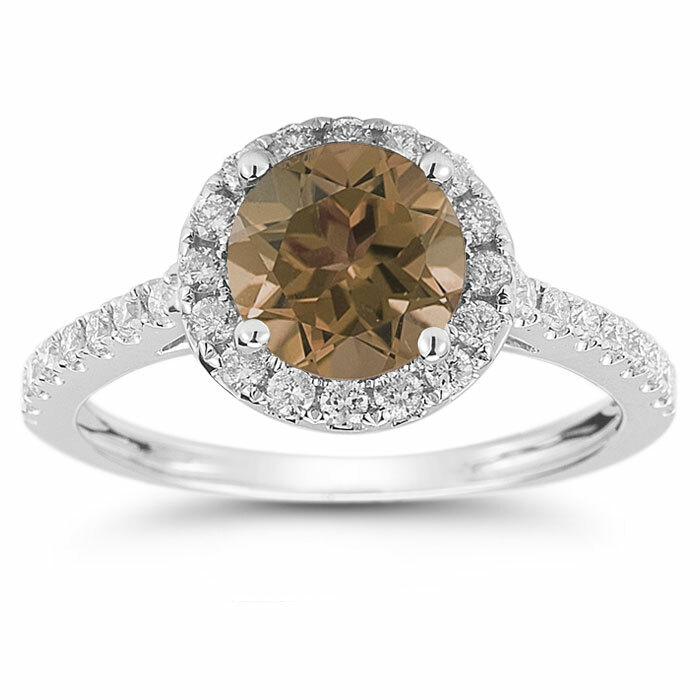 This understated warm hue gives this ring a look that's both versatile and glamorous, with rich, intriguing beauty. 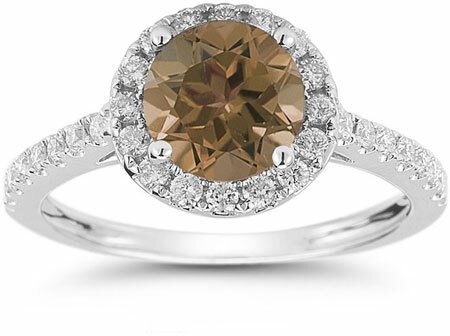 Serving as accents to this stunning smokey quartz are 30 small round diamonds that add extra dazzle. A total of 16 of these accent stones create a glimmering frame around the center gem while the 14 diamonds that remain glitter from the cool, sleek 14K white gold band. We guarantee our Smokey Quartz and Diamond Halo Gemstone Ring in 14K White Gold to be high quality, authentic jewelry, as described above.